This page sets out what I have on the dress and equipage of the four regiments of Gloucestershire Local Militia: 1st East, 2nd East or North, West and Cotswold. The two East and the West regiments were formed in 1809, and their commanding officers commissioned that year; the 2nd East was re-titled the North in 1813, while the Cotswold was formed the same year. All were disbanded in 1816, though skeleton staffs were maintained until their reduction in 1829, the “reduced adjutants” being paid allowances for many years after. Two tailors’ items below date from the ‘twenties or later, showing that these officers still had occasion to wear uniform. What follows is certainly nowhere near complete, and when new information arrives it will be added. Information from the P W Reynolds Gloucestershire notebook at the V&A comes courtesy of Ben Townsend, to whom go many thanks. The references mentioned for buttons in each section are: Howard Ripley & Bob Moodie, Local Militia Buttons, 1994, 2nd edition 2002; Daniel Brinson, Military Insignia of Gloucestershire, 2009. The two Gloucestershire “regular” militia regiments were similarly dressed, with dark blue facings and regularly spaced buttons in tens. Documentation of the officers’ metal colour is a little confused by the Hamilton Smith chart of 1815, which shows gold for both, but, as copied by P W Reynolds, silver for the South Regiment. However, other sources – tailors’ books and drawings by Dighton – clearly and consistently show that in the period from 1809 the South Gloucestershire used gold and the North Gloucestershire silver. 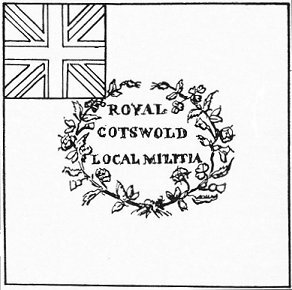 The evidence below for what was worn by the four Local Militia regiments suggests that, on this basis, the 1st East and Cotswold Local followed the South Gloucestershire (gold), and the 2nd East / North Local followed the North Gloucestershire (silver), while evidence for the West Local is lacking. Patterns of belt plates and buttons were regiment specific. 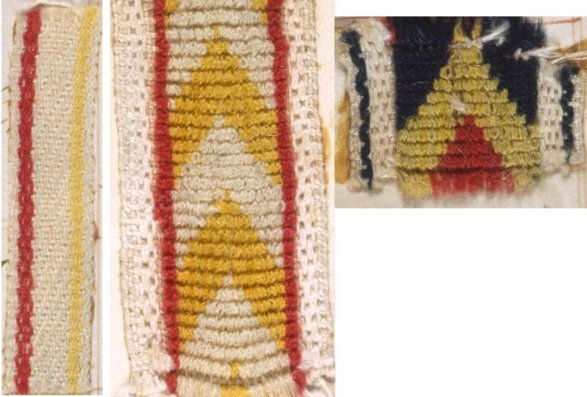 The ten regularly spaced, pointed loops on the men’s jackets of both “regular” militia regiments were of a common pattern of lace, with a red and a yellow stripe near each edge; the Pearse clothier’s books at the Canadian War Museum note that this was worn “Yellow edge out”, meaning the yellow stripe on the outside of the loop. The Pearse entries also show that the South Gloucestershire’s battalion and grenadier company jackets had 18 large buttons and 12 small, indicating diagonal “slash” pocket flaps that required no small buttons to hold them shut, perhaps a legacy of the light infantry character that this regiment liked to adopt. The North Gloucestershire’s battalion and grenadier jackets, on the other hand, had 18 large and 14 small buttons, showing that their pocket flaps were “cross” or horizontal, each flap needing a single small button to close it. The men of the local regiments would have adhered closely to these patterns. Drummers of both “regular” and local militia, in common with all regiments with “Royal” facings, wore red jackets faced blue throughout this period, not reversed colours. The South Gloucestershire’s “broad” lace for drummers was white, with alternate yellow and white chevrons between narrow red stripes. 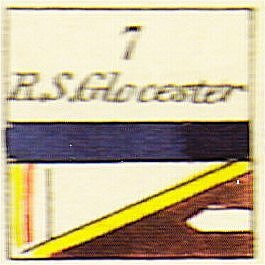 That for the North Gloucestershire had chevrons in an ascending sequence of red, yellow, blue, between white edges each carrying a narrow blue stripe. The Local Militia regiments would have used one of these laces or something very close to them. The “regular” drummers’ lacings were complex: the broad laces were used in each case on the “body” (meaning the two extra lines of lace running vertically at each side of the front), seams (side, back and sleeve), and sleeve darts. A narrower “binding” version of this lace was used elsewhere on the jacket, with the front loops in the same form and pattern as on the men’s jackets. The details in Pearse are less than complete, and in any case, there is no evidence to show how closely or otherwise the drummer’s clothing of the local regiments may have followed that of the “regulars”. Lieut Col Comm Sir Berkeley William Guise, commissioned 14 April 1809. The dress of this regiment appears to have followed that of the South Gloucestershire “regular” Militia – for further details see above under “General remarks”. A battalion company officer’s coat is kept at the Soldiers of Gloucestershire Museum. It is scarlet with dark blue collar, lapels and cuffs, without edging. The front has two rows of nine large buttons, with four large on each cuff and pocket flap, and two large at the rear waist. Each side of the collar has one small button, with two small just over half way down each pleat, and one small on the epaulette. The upper three buttons on each lapel have dark blue twist button holes, as do the collar and cuff buttons. The pocket flaps have scarlet twist button holes, with four white twist “holes” at the rear waist. The pockets have the buttons set on the flaps, not below, and the lower edges are cut “cross”, as opposed to “pointed”. The white turnbacks are narrowly edged in dark blue, their points held by a gold wire garter star on a dark blue cloth backing. The buttons are gilt, convex, showing in relief a crowned eight rayed star bearing a simple garter inscribed “Gloucester ● Local” enclosing an “M”. This matches drawings in Ripley and Moodie and in Brinson. The British Military Buttons site shows an example which appears to be silvered; if so, this might be for a sergeant or senior NCO. The gold epaulette has a striped (“vellum”) lace strap, with no other colours to the edging, no insignia, and a relatively long bullion fringe. 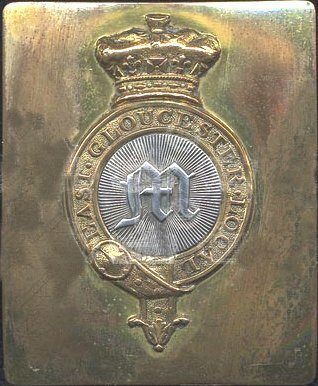 An officer’s shoulder belt plate, also at the Museum, is rectangular, gilt, showing in relief a coronet on a garter inscribed “East ● Gloucester ● Local”, enclosing, entirely in silver, a circular rayed ground bearing an old English “M”. The copy of the Hawkes tailor’s book at the National Army Museum contains an entry titled “East Gloucester Militia”, post-dating disbandment in 1816, so for an officer on the staff or reduced adjutant. This calls for a scarlet coat, apparently of the 1829 type, edged in white, with [dark] blue collar and cuffs, buttons in tens on the front, regularly spaced, two silver lace button holes at each end of the collar, pointed “slash” pocket flaps with four silver holes, a pointed flap and four silver holes to each cuff , and white turnbacks edged in [dark] blue. The change to silver lace may date from 1831, when this was prescribed for all militia. The P W Reynolds Gloucestershire notebook at the V&A describes, from the notebook of militia colours then at the RUSI, the regimental colour as blue, with the Royal arms in the centre and a three part scroll below, with no further details. Lieut Col Comm Sir Henry Lippencott, commissioned 9 May 1809. The regiment was re-titled, and its headquarters moved, in 1813. The dress of this regiment appears to have followed that of the North Gloucestershire “regular” Militia – for further details see above under “General remarks”. The Hawkes tailor’s book includes an entry that, judging by the style, post-dates the disbandment of the regiment in 1816, so would be for an officer on the staff or reduced adjutant. This specifies a scarlet coat with [dark] blue collar, cuffs and lapels, with ten buttons and silver lace loops on each lapel, four buttons and loops on each cuff and pocket flap, two at the rear waist and two on each side of the collar. The collar is described as “Prussian” (i.e. closed) and the notes require the lapels to be “buttend on as a Stomager” (stomacher), indicating the broad, plastron look of the ‘twenties. Though this is of a late date, the silver lace here matches the silvered buttons recorded for this regiment, convex, 19 mm in diameter, showing in relief a crown within “North ● Gloucester”. An example was sold recently on The Military Gentleman site, and the pattern is recorded by Ripley and Moodie, and by Brinson, who also note pewter versions, used on the men’s jackets. Ripley and Moodie (2002) mention an extant officer’s coatee of the pattern worn between 1822 and 1829; I do not know its location. It’s conceivable that the belt plate shown above, marked “East Gloucester”, was also used by this regiment before reorganisation and re-titling in 1813, though this is speculation. Lieut Col Comm Thomas, Lord Ducie, commissioned 4 April 1809. 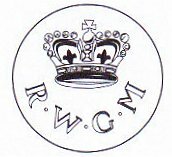 A button, in pewter for the men’s jackets, is recorded by Ripley and Moodie, and by Brinson; it shows a crown above “R ● W ● G ● M”. Lieut Col Comm Henry George, Lord Apsley, commissioned 24 January 1813. The Hawkes tailor’s book contains an entry for an officer’s jacket (also copied into the Reynolds Gloucestershire notebook in a very faulty transcription by “DHI”). The scarlet jacket has [dark] blue collar, lapels and cuffs, with “a small edge of Blue Cloth to appear on scarlet side of lapel”. The front has two rows of ten large buttons; on the blue lapel facings the top four have twist button holes “made long and notched”. The cuffs presumably have four large buttons and twist holes, though this is not stated as such. The collar has a small button on each side with a twist hole, The pocket flaps are pointed and “slash” (diagonal), each with four large buttons and scarlet twist holes. The rear skirts have four “holes” with four large buttons, presumably two at the rear waist, either side of the “holes” and one in each pleat. The white turnbacks are edged in blue cloth. The total number of buttons is given as 40/4, meaning 40 large and four small. The large are already accounted for, while the four small, besides the collar, might include two buttons for epaulettes. 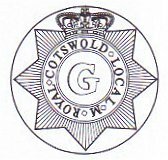 bearing a simple garter inscribed “Royal ● Cotswold ● Local ● M ●”, enclosing a large “G”. Reynolds, working from the RUSI notebook of militia colours, describes the regimental colour as a “blue flag of the ordinary pattern”, meaning at the centre the title in yellow or gold within a Union wreath. In Volume V of his History of the Uniforms of the British Army (1967) C C P Lawson provides, without any commentary, a sketch of this, though the wreath looks a little large for the Union canton, to my eye.